Due to HMRC introducing Real Time Payments, we are required to submit a return on your behalf on or before the pay date on the payslip. This means we are no longer able to produce payslips after the pay period has ended. We therefore require you to submit your timesheets to BEFORE the end of each month. 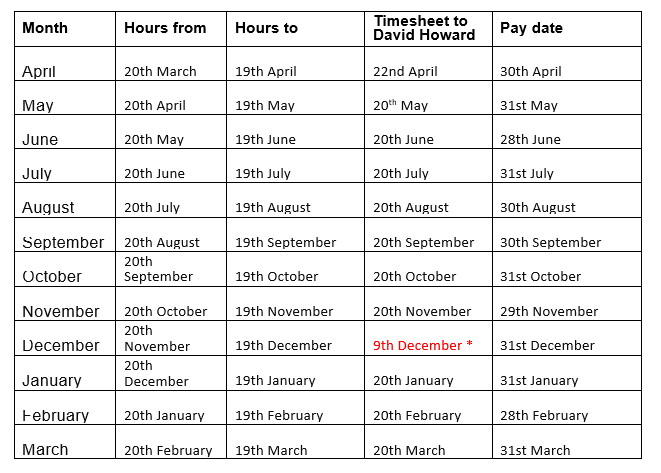 Timesheets that are sent to us after the required date, may not be processed until the following month and may incur penalties from HMRC. You MUST also let us know EVERY MONTH if there have been no hours worked by your employees, as a NIL submission needs to be sent to HMRC (this is charged at £3.50 +VAT). If you would prefer to estimate the hours your employees will work from the 19th to the end of the month, and make adjustments the following month this is also acceptable. However you will need to keep your own record of this, as payslips cannot be adjusted after pay day. *As in previous years our office will be closed over the Christmas period, reopening in the New Year and we would advise that the timesheets are in to the office on the 9th December 2019 to avoid the Christmas post delays. We therefore would advise estimating hours over this period to be corrected in the January 2020 Payroll. Contact the payroll team by completing the Contact Us form on our website or use the Livechat below.